A proper fall yard cleanup puts you ahead of the game when spring arrives. Fall is here, which means it's time to clean up your yard and prepare for the cool days ahead. A little work now will lead to a big payoff when spring arrives. The most efficient way to start is at the top, by pruning trees, trimming hedges and cleaning gutters. After that, work your way down. Protect your deck by cleaning and staining it, close the pool and start composting. Finish on the ground with a little lawn maintenance, garden sweep and overall assessment. 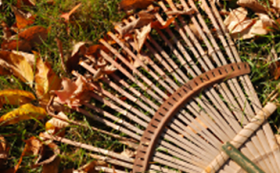 Use the following checklist to make your annual fall yard cleanup easy and enjoyable. Visit HomeDepot.ca for the full article.